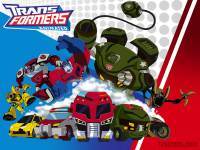 Home » Animated » Happy 10th birthday, Transformers Animated! Happy 10th birthday, Transformers Animated! On 26 December 2007, a new Transformers show, Transformers Animated, made its debut with a three episode pilot which launched a new and different take on the Transformers mythos. Where Optimus Prime was once the supreme commander of the Autobot forces, now he was just a lowly starship captain of a spacebridge repair crew. The Decepticons were powerful and formidable, and the setting was an Earth 50 years into the future, where high technology made robots commonplace and technologically enhanced super villains a part of life. This was Transformers Animated. 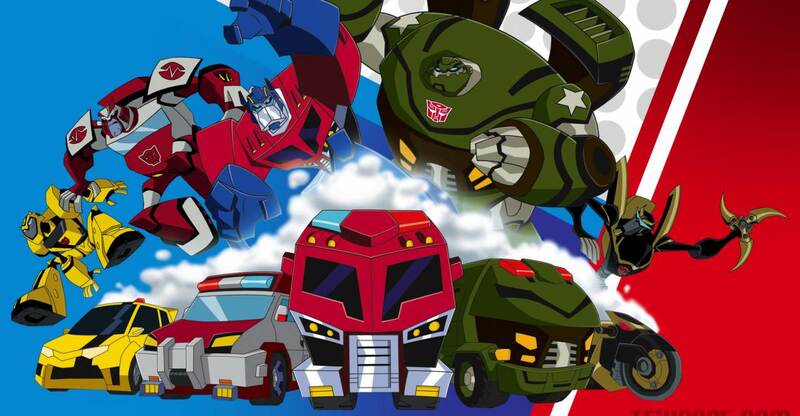 We’ve chosen to mark its ten-year anniversary today, on the anniversary of its first non-pilot episode airing, to reflect how Transformers Animated was Transformers in the year 2008, sandwiched between two movie years. We’re also going to dive into how Transformers Animated was a show cut tragically short by a combination of circumstances, and what its lasting legacy has been. Read the full discussion after the break! Debuting in 2007, Transformers Animated was at the time of airing the first fully western written and produced Transformers show since Beast Machines. It took Transformers back to its cel-animated roots, with slickly animated action sequences, a good mix of self-contained and ongoing plots, and some genuinely funny moments over the course of its 42 episode run. It shook up the formula by making the Autobots a maintenance crew, rather than warriors, by setting the series in peacetime after the Decepticons were defeated (although very much still out there waiting their moment to return) – and by fixing it so Optimus Prime was not the invincible hero Autobot leader, but crucially a flawed individual with doubts, who has made (and still occasionally makes) mistakes, and is not even close to the leader of the Autobots. After an initially rocky reception, the show rose to become a fan-favorite installment in the Transformers mythos, leading many to mourn its passing and for years after to request Hasbro to release the final toys who were cancelled by the line’s abrupt end. Some eventually made it out as Toys R Us exclusives, others made it out in Japan – but a handful never saw the light of day. The story of Transformers Animated began in 2006, when news started to emerge of a new Transformers series being worked on following the end of Transformers Cybertron, under the name of Transformers: Hero. The working title was derived from the show’s core concept of taking the main cast and treating them like superheroes, a unique twist used for the show that set it apart from previous shows and the live action movies, which treated Transformers as a “war” story, or a space opera. Our first look at Transformers Animated Optimus Prime, from 19 June 2007. 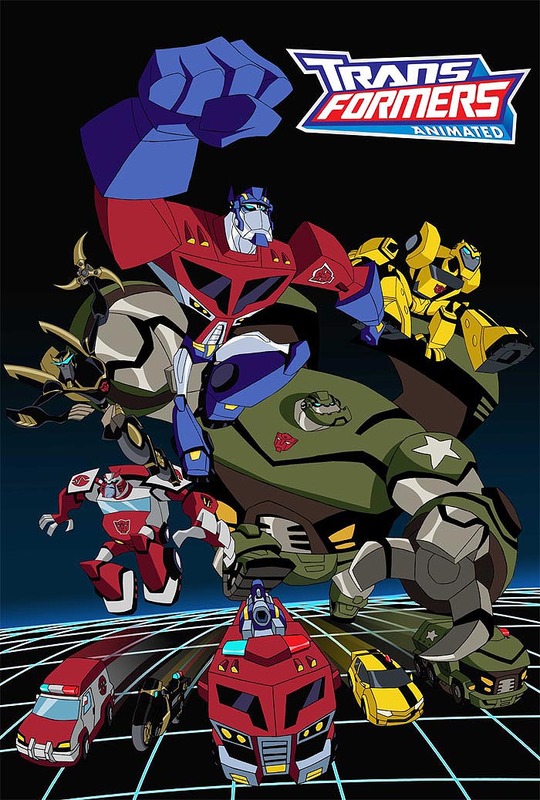 The show’s name was confirmed in April 2007 to be Transformers: Animated, a play on how it would be the animated series following the live-action movie, and also a reference to the show’s slick style. 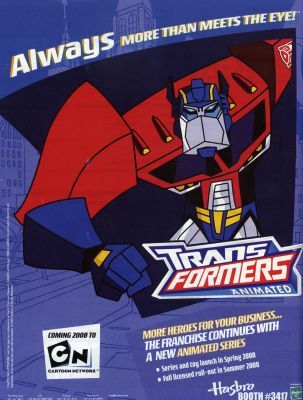 On June 19, 2007, we got our first look at Optimus Prime from Transformers Animated. Reception was overwhelmingly negative, with many fans swearing they were done with Transformers, with not one but two incarnations taking their beloved robots in disguise in divergent directions from their beloved Generation 1 roots in 2007. And in fairness, this was not completely unjustified. Michael Bay’s Transformers was around the corner with its excessively detailed (some might even say overworked) designs, while on the surface of things, Transformers Animated was extremely stylized and simplified, to the point of being cartoony or exaggerated. Attitudes began to soften fairly quickly once actual footage of the show emerged at San Diego Comic Con 2007. The show’s stylized designs looked much better in motion, with the high production values and the care of the team working on the show evident from the first footage. Early rumors suggested that the characters would transform with a “tazmanian devil spin”, which was shown in the early footage, alongside more traditional and detailed transformations. Moreover, the initial footage revealed a return of the Dinobots – their first onscreen depiction since Generation 1 – along with a Generation 1 inspired Arcee, and Tom Kenny doing a fantastic performance as Starscream inspired by the late Chris Latta’s style. Truly, it was a Transformers cartoon that was updating the show for a new audience while maintaining a strong connection with its earlier identity as a franchise – kind of an “Ultimate Transformers” take on the franchise like what Marvel was doing with X-Men and Spider-Man at the time. Crucially, the show was not a co-production intended for simultaneous US and Japanese airing – in fact, Japan would not get Transformers Animated until 2010, two whole years after the US. They made up for it with an awesome opening song by JAM Project, granted. The show premiered on Cartoon Network on 26 December 2007, with the first two seasons of the show airing back-to-back from January 5 2008 to June 28, 2008. A third season would air in 2009 between March 14 and May 23. The show went with a similar approach to the popular Beast Wars series, with individual episodes having an A plot contained largely within the episode, and a secondary plot or theme which united them into an ongoing season-long arc. For example, the first season focused on Megatron acting as a puppet master, manipulating things from behind the scenes to effect the creation of a new body for himself, while the second season dealt with Megatron’s ongoing plan to construct a spacebridge to attach Cybertron while most individual episodes also dealt with fragments of the Allspark being technology to life in strange and interesting ways. The characters themselves also grew and changed over the course of the series. For example, Lockdown’s rivalry with Prowl developed over the course of his many appearances, while Bulkhead’s complicated relationship with the Constructicons was developed each time the latter group appeared in the show. Every season made good use of flashback episodes to flesh out the backstories of the Autobots, and to shed light on how they became the robots they are, culminating in the third season’s flashback episode showing the origins of the team. We never got as much background on the Decepticons, although thought was given to a Blackarachnia and Blitzwing focused flashback episode in the unmade season 4. The show was also notable for how it treated its villains. Early on, the Autobots would face not only Decepticons, but also human villains, given unique abilities through technology. The opponents, both human and Decepticon, had unique abilities and there were often other factors in play that forced the Autobots to come up with clever solutions to their problems. This together with the unique abilities each character possessed meant that battles and other action sequences were more exciting than the “stand and shoot, then someone uses a stock footage supermove” action from previous shows. The use of human opponents also meant that the Decepticons tended to be held in reserve, and when they did show up it was an event, as they were as powerful as the whole team together, really forcing the Autobots to rely on their wits and teamwork to overcome the odds. We’d also be doing the show a disservice if we did not cover another reason that made the Decepticons and other characters so memorable when they showed up – their personalities. From the easily led and Weird-Al quoting Wreck Gar (voiced by Weird Al) to the triple changing, triple personalitied Blitzwing, to the narcissistic and petty Sentinel Prime, to the GLORIOUS Lugnut, to a wonderfully voiced and performed Starscream, each and every character had a personality, quirks, and goals of their own which allowed them to stand out as memorable characters. Even the humans, such as Captain “this is why I hate machines” Fanzone to villains like Nanosec and Meltdown had something unique and memorable to offer. This is also to say nothing of the number of characters who made cameos throughout the show’s run, particularly in the later seasons when we got to see more of Cybertron and every scene on the planet was packed with characters familiar and obscure. Naturally as a merchandise-led franchise, Transformers Animated had a toyline to accompany it, and as a post-movie toyline, the line was split into different tiers much as the 2007 movie line had been. For younger fans, there were the Bumper Battlers and the spring-loaded Activators, which replaced the Basic / Scout class. The main line was made up of Deluxe, Voyager, and Leader class figures, which boasted an unprecedented level of show accuracy, and some of which were quite amazing with how well they managed to make a robot turn into a vehicle, considering that some of the designs in the show clearly needed to cheat to work. Moreover, the line lacked a linewide gimmick, with the focus instead placed on making bringing each character to life with their signature weapons or signature transformation. This really worked in the line’s favour, as did the overall quality of the figures’ sculpts, which exuded character even when they were just stood in a completely neutral pose on a shelf. When considering both the toys and the show together, it came over as being a real love-letter to long time fans as well as a well-made show, one developed with lots of care and attention. By all accounts, the show should have succeeded and enjoyed a much longer lifetime than its one-year run. 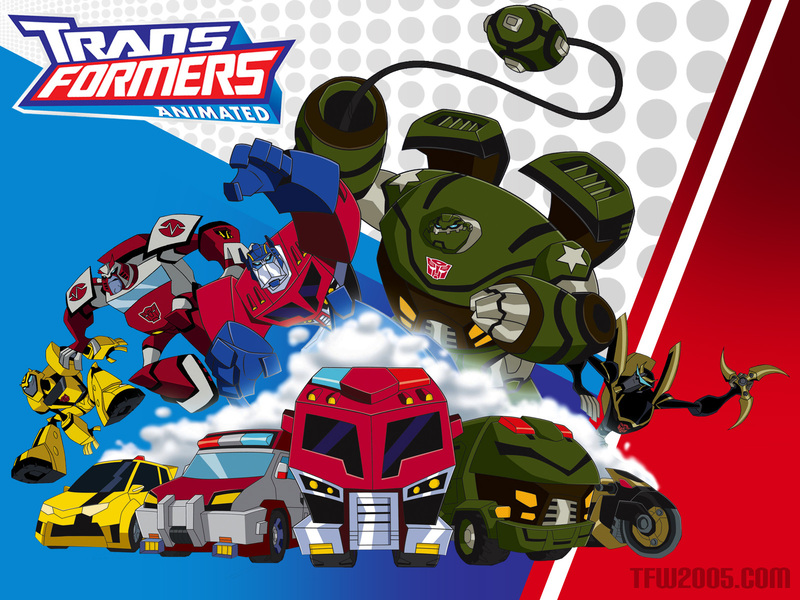 Transformers Animated ultimately fell victim to the success of another branch of the Transformers franchise – the live-action movies. Because Transformers was so successful in theaters in 2007, there was strong retailer demand for more movie toys on store shelves – something which delayed the launch of the Transformers Animated line by a whole six months, meaning that instead of the toys hitting shelves to coincide with the airing of the show in January 2008, they arrived in June 2008, by which time season 2 had already almost finished its initial run on Cartoon Network. This surely must have hurt the line’s toy sales, as it meant you couldn’t go out and buy that cool character you just saw on screen. And even once the toys were out, the retailers were still demanding more “realistic Transformers”, this time, the Universe toyline. Details suggest that the Universe toyline sold far more strongly than the Transformers Animated toyline, which was particularly shocking as Universe had no dedicated show or comic to support it. The show itself fared little better. Although it was a co-production between Hasbro and Cartoon Network, Cartoon Network did little to promote the show past its premiere, and moved the show into a poor timeslot as was the case with other Transformers shows on the network. Character designer Derrick J Wyatt had at one point suggested there were issues behind the scenes which hurt the series, an accusation that seems to hold water given that the show was a co-production, unlike earlier shows to suffer the same fate. A final nail in the coffin would also have been Hasbro partnering with Discovery to launch their own network, prompting Cartoon Network to decide there was no future in the show. The final factor that ultimately brought down Transformers Animated was its timing. Coming out between Transformers 2007 and Revenge of the Fallen meant the line was perhaps destined to be curtailed – particularly given the stated retailer demand for movie toys, and the wild success of the two movies. At this point in history, Hasbro was of the mentality that the movie line should be the only thing on shelves, meaning even if the other issues had been avoided, Transformers Animated would have still run into a brick wall around May 2009 when The Fallen took his revenge, and all the available shelfspace (or was that just Bumblebee?). Transformers Animated, in the end, was a series perhaps fated to be a star burning half as long, but twice as bright. What we are here to do though is celebrate Transformers Animated, and as well as recognising its 42 well-written episodes, we can look at the lasting impact the show has had on Transformers as a whole. Speaking at Botcon 2009, Hasbro called the show the “benchmark” of quality for future Transformers shows – although it can be argued that nothing to have come since has truly lived up to the series. Transformers Animated, unlike Beast Wars before it, did not really invent any new concepts which have since permeated the whole Transformers mythos. It was an “Ultimate Transformers”, a distillation of everything that made the preceding 25 years worth of stories enjoyable, rather than an innovator. But what it did do, it did extremely well, with detailed character arcs, memorable personalities, and even establishing the broad template for the membership of “Team Optimus Prime” – compare, if you will, with Transformers Prime who had 4/5 of the same characters on its core cast – with the fifth one, Prowl / Arcee both being stoic types who turned into motorcycles. A selection of characters from Transformers Animated, and the later toy releases who were inspired by them. Transformers Animated created some memorable characters, none more prominent than the Transformers answer to Boba Fett, Lockdown, who has gone on to appear in the IDW comics and served as the main antagonist of Transformers Age of Extinction, not only that but also having one of the best showdowns with the heroes to date in that movie. He has become established as a default choice of bounty hunter for the Transformers mythos. He also lays claim to an extensive number of toys, including several based on his Animated design in the Revenge of the Fallen line. Right there with Lockdown is Bulkhead, who went on to become one of the five main Autobots in Transformers Prime and one to make a cameo toward the end of the Robots in Disguise cartoon. Such is Bulkhead’s rise to prominence that we’d not be surprised if Bulkhead might also get some kind of a role in the upcoming Transformers Cyberverse series – perhaps as a friend to Bumblebee in the latter’s Cybertron days, much as Animated Bumblebee and Bulkhead were friends in the academy. Among the other Autobots, Animated established a different personality for Ratchet which again carried over to Transformers Prime, and potentially beyond, as well as establishing a warhammer as Ultra Magnus’ weapon of choice. On a lesser note, Lugnut has also become a character spreading beyond Transformers Animated, with a release in the Generations line and cameos in the IDW comics, as did the Animated interpretation of Blitzwing, at around the same time. Slipstream, the female Starscream clone, has also become the default concept for a female Seeker, with two different toys released over the last few years. We’re actually surprised she never made it into IDW’s comics – she might have been a good foil for Windblade. With that being said, one thing we wish Animated had been able to carry on was the sense of threat that the Decepticons presented, by using them sparingly and offering up other, lesser threats such as human villains. Hasbro themselves are reported to have requested that human villains be taken out of the show to place more focus on the Decepticons, which unfortunately undermined the idea of making the Decepticons credible threats later in the show’s run, although they always outclassed the Autobots whenever they appeared. Human villains have been used considerably less since Transformers Animated, with even Transformers Prime downplaying its human antagonists considerably, and writing them out completely early in the second season. Will we see another like it? So with all of this being said, the final question is, will we one day see another show which could rival Transformers Animated as a fan-favoured entry into the Transformers mythos? We’d say wholeheartedly, yes. There was no special circumstances that made Transformers Animated that could not be repeated right now, in fact. All it needs is for a team to make a show who care about the source material, treat it with respect, and put an interesting spin on it while also connecting with that identity that makes something undeniably Transformers. For all we know, Boulder Media could be about to do just that with Transformers Cyberverse. Transformers Animated was an amazing series. While it did not get nearly the amount of love or retailer support it needed out of the gate to make the most of its run, it gave fans a Transformers show that was clever, well-written, that respected what made Transformers so enjoyable and that respected the wider mythos, while also giving its own presentational spin and creating some unique story arcs to accompany the show. It is hard to believe ten years have passed since the show first aired. We’ll be rewatching some of our favorite episodes later today, will you join us? Transformers Animated footage, with the full-length intro song. We hope the second verse will be used again in the future! We need a season 4 to wrap things up! Also apparently if we as a fandom shout loud enough at Hasbro via forums and interwebs, we can possibly get something from Animated again. Maybe not a next season but a comic or something at least! If this is a social media event maybe it would be better to tell everyone what it is in advance? just in a idea. It's been organized via a Discord group I joined not too long ago. It's going to span social media platforms and TFW. At it's core, the purpose is to try and drum up support for/get Hastak to notice that there is still demand for Animated-related content, and it deserves as much recognition as the other parts of the franchise. The ultimate hope is that Hasbro will get the old team back together, so we can finally get the legendary Season 4, at least in comic book form. Of course, that last one is a long shot, but our hope is Animated at least gets more direct homages in media, and in the form of new toys, such as a Leader or Commander-class Lugnut. The Blitzwing we got in T30 and giving Ultra Magnus a hammer every so often just isn't up to snuff. Prepare thyselves for the love bomb for TFA, to drop in less than 24 hours. Beast Wars is actually getting recognition; Warden confirmed that the 25th anniversary is going to have something special. And at least they had a Hasbro-recognized 10th Anniversary celebration. A little self-plug, but might I suggest checking out this thread I created not too long after TFCon. I'll add it to my sig sometime; people need to know it's a possibility. I don't know if you've heard, but there' very slim chance we might be able to get Hasbro to revisit the universe. i know thats why i love it!!!!!!! I don't know if you've heard, but there's a very slim chance we might be able to get Hasbro to revisit the universe. The cartoony-ness is why many of us look back on it fondly. I'm fairly certain that Sentinel was designed only after he was cast, hence the strong resemblance between him and the Tick. He was; I checked the wiki page. They're played by the same voice actor. Sentinel Prime is like a transforming version of The Tick. Heck they even sound the same. Wow. Sentinel Prime is a jerk. I had forgotten that. Well, that's a bit of a downer of a post. Oh no. I meant to say that I really like it now. I guess I had to mature into it. I've begun rewatching it after 10 years. I was originally put off by the by the art style but now it Doesnt bother me as much. I've seen a lot worse over the years. I still think Sari is annoying though. Sari's one of my favorite characters and I was so mad there were never any figures of her. Hearing there was GONNA be a figure of her (and a darn cool-lookin' one at that) before it was cancelled makes me so salty. I'll just put that on the long, long list of "Things I am bitter about, and will continue to be bitter about, until the day I die!" Sari's probably my favorite character from the show, too. At least give us a model kit, dammit!